I have to say it was an experience and a lovely prize. Competition winner Louise Grierson certainly had a memorable time at one of the more eventful Crufts of recent years. Louise was fortunate enough to win the www.pet-insurance.co.uk competition to for a pair of tickets to the Crufts Sunday Exhibition and Best in Show on Sunday 13th March 2016. From Schnauzers to Shar Peis and Afghans to Airedales, many of the finest breeds of canine were represented in this globally-renowned competition. Young and old alike flocked to the event, fascinated by Crufts enduring appeal. This has been a fantastic year and a wonderful final, and it’s clear to see why, for 125 years, Crufts has been one of the major British events. 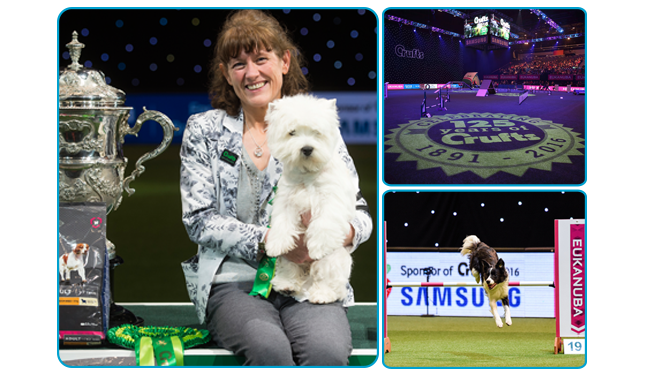 Crufts organiser Caroline Kisko said about the landmark anniversary event. 22,000 dogs competed for the world class title of Crufts Best In Show but, in the end, there could be only one. West Highland Terrier Devon beat whippet Hazel into the runner-up spot in the competition for the main prize. In front of a packed arena, and a huge TV audience watching at home on Channel 4, Devon (also affectionately known as Geordie Girl!) scooped the top gong. The terrier, who turns two in July, was chosen by top judge Derek Smith and awarded the prestigious Best In Show title. Her owner, Marie Burns of Bishop Auckland in County Durham, was dumbfounded by the recognition: I can’t believe it, it was amazing. She is a typical terrier, a bit of a tomboy, very independent and fun to be around. I’m so thankful to everyone who has helped us get there. I can’t believe it, she’s the first West Highland Terrier to win in more than 20 years. Of course, Crufts isn’t just about the Best In show competition and for four days thousands of people passed through the doors of the Birmingham NEC. Those lucky enough to attend were able to witness events as diverse and exciting as the West Midlands Police Display, where active police dogs and their handlers wowed the crowds for twenty minutes, to the Scruffts Final, the nation’s favourite crossbreed competition, on the Saturday evening. The last word on this year’s event is probably best left to the owner of Devon: Am I dreaming? This is absolutely amazing, I can’t believe it and can’t find words to describe how I feel. Congratulations again to Marie Burns and the fabulous Geordie Girl!